"For the lady, perhaps a salad?" "Perhaps not." We’ve all heard the phrase, “you are what you eat” however the phrase is slightly changing. The new version is, “you eat what you are.” In American culture, food and gender have been and continue to be closely intertwined. Our views on what’s masculine and feminine are portrayed much through food choices and eating habits. This results from people’s body images and how they want to be seen by others. For example: when was the last time you saw a muscular man in a commercial eating Chobani yogurt? Then there’s the other side, where you’ll find most big, hungry men featured eating juicy, thick burgers covered with cheese and strips of bacon. There are a few exceptions, but if a woman is portrayed eating a half pound of meat, 99% of the time she’s wearing a bikini with slow motion wind blowing her flawless long hair. 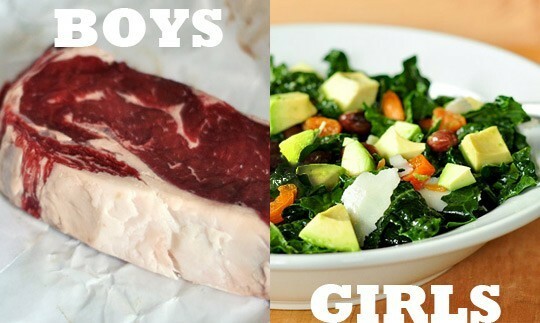 Men and women experience food very differently. Scientists found that as meal size increases, women are perceived as less feminine whereas men are seen to be just as masculine. 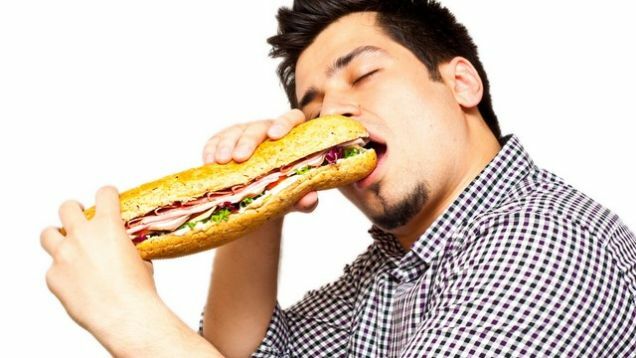 Men feel a sense of entitlement to eat whatever they want, whenever they want, and wherever they want it. The spontaneity and expansiveness of men’s eating behavior shows how men enjoy greater social freedoms. In fact, another study showed that men actually eat MORE around women. The participants in the study ironically went on to say they had not consciously taken their dining partner’s gender into consideration when loading up on food, which means that something subconscious is driving them to chow down. This can go back all the way to prehistoric times why men feel the need to eat more around women. The standard American ideology that is engraved into our minds is that men can and must eat more than women. Men “need” the energy and calories because they’re bigger and stronger. But I want to “need” more calories too. It’s a primitive, patriarchal way of thinking, but our subconscious minds have accepted it and it’s almost impossible to erase. Sure, if you’re a 6’3″ male that weighs 210 pounds, you’re most likely going to be able to eat more than a female who’s 5’4″ that weighs 120 pounds. I’m a 5’11” female but I have an appetite. A big one, at that. The average male height is 5’9″, so does this mean that even though I’m taller than the average male, I’m supposed to, and am expected to, eat less than them? If a man overeats, it’s not such a big deal. Recently, a new trend that is “socially acceptable” for men is the “dad bod”. That’s perfectly fine, but did I miss the “mom bod” trend that accepted and honored women for not being perfectly toned? Men who participate in eating contests are seen as heroes, as if they have just proved their masculinity. If and when women engage in similar activities, they are considered masculine, gross, and unattractive. The normalized idea that women eat “light” salads and fruit perpetuates a toxic mentality in women. The notion that in order to be seen as attractive, they need to stay at a low weight and be “thin” is engraved in many people’s minds. This ideology basically states that women are so much more fragile that eating a cheeseburger would certainly cause them maximal displeasure. It’s hard to change an ideology that has been normalized for decades upon decades. However, I will say the idea that all women have to be thin to be attractive is changing. There are companies, such as Aeropostale that do not photoshop on their models. This is redefining the “supermodel standard”, and shows diverse female bodies from all different shapes and sizes. Sports Illustrated recently had their first plus size model on the cover of one of their magazines. We are far from being accepting of all bodies, it is comforting to know there are people attempting to make a change in our society. And remember, you’re not society– you are a complex individual with the adept capability to change your mind. Don’t let the “you eat what you are” hold your brilliant expansive mind frame in a box.